Associated Bank colleagues at the annual Recognition Luncheon. Pictured left to right: Jordan Hoerter, Andrew Shallow, Alfred Nakhla, Chad Otte, Heidi Rausch, Dustin Peterson, Denis Burgess, Carries Baumann and Dennis DeLoye. 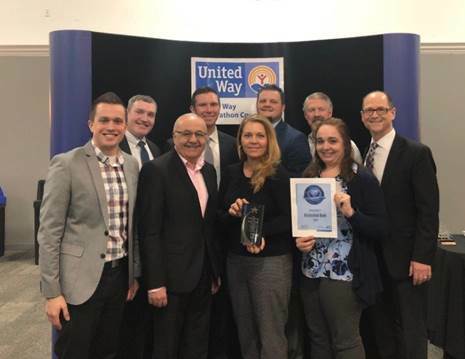 Associated Bank was recognized with the Live United award by the United Way of Marathon County at their recent annual Recognition Luncheon on January 23. The Live United award is given to a company that exemplifies what it means to live united in the community through a combination of charitable dollars, board membership and leadership, volunteerism, sponsorship and more. Dennis DeLoye, community market president for Central Wisconsin, was also recognized at the event for his efforts as the 2018 United Way president. DeLoye has been an active donor to the United Way for over 30 years. In 2011, he created a finance committee while serving as treasurer and in 2015 began a three-year officer rotation. He will remain on the board and executive committee as past president. For the past eight years, Associated has raised more than $1 million annually for the United Way through a combination of colleague contributions, local fundraisers, online auctions and a corporate match.